A message dating back to the 1880's has been found on an Australian beach. There's a suffix which is used to describe people who like to visit particular places. Which of these words is used to describe someone who likes to attend the theatre? 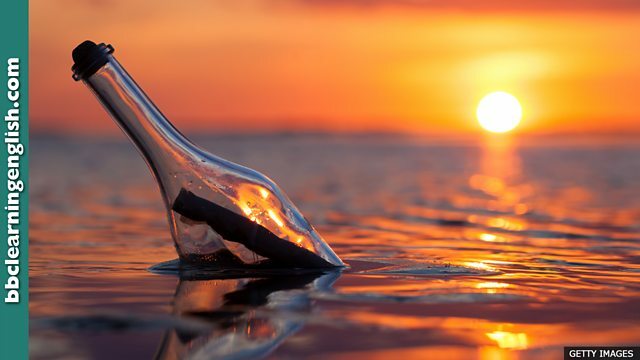 What's thought to be the world's oldest message in a bottle has been found in Western Australia. The discovery was made by a woman walking on a beach north of Perth. But far from sending out an SOS, the note inside was part of a German scientific study carried out in 1886. • The streets were full of theatregoers waiting to see their favourite plays. • The bus was full of sand from all the beachgoers on their way home. • The film La La Land is a love letter to Hollywood. • The Grammar Gameshow is Dan's love letter to gameshows. • You can't do anything about the sands of time. Nothing lasts forever. What verb collocates with 'party'? Which word describes people who go to parties? What is inside an hourglass (a very old-fashioned glass device for measuring time)? Complete this phrase that we use to say that the passing of time is inevitable: The ______ of time. Which phrase means 'a creative tribute'?